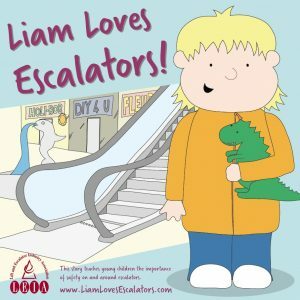 LEIA is proud to present the ‘Liam Loves’ safety campaign, encouraging children and their families to be safe when using lifts and escalators. LEIA has created a series of fun, free children’s books for young children to enjoy and learn from. One of LEIA’s key objectives is to provide advice on health, safety and standards and the ‘Liam Loves’ children’s safety campaign highlights our commitment to this cause. Liam is an inquisitive little boy whose love of exploring can something cause him and his favourite toys to get into mischief. 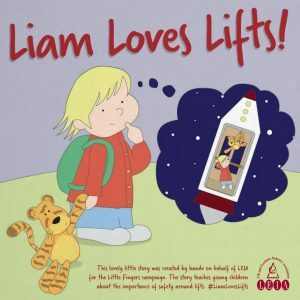 In the first book, ‘Liam Loves Lifts’, Liam and his toy tiger, Stripey get into a spot of trouble when Stripey’s tail gets caught in the lift’s sliding doors. Stripey’s tail is set free from the lift doors, but is now a little bit squished! Now little Liam knows to be careful when using lifts to keep little fingers, and little tails, safe. Contact LEIA to request a FREE copy of the book and height chart. Please note that there is a restriction of 1 copy per request, but larger orders can be placed with a cost for delivery. We are able to deliver to UK postal addresses only.